If you have lost your teeth due to decay, disease, or injury, you now have an alternative to traditional dentures. 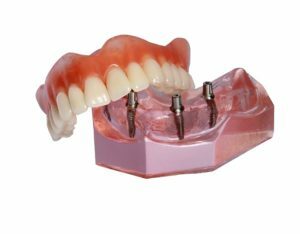 All on 4 is different than other options because it does not use suction or an adhesive to hold the denture in place. Instead, an average of 4 dental implant posts are used, which are surgically placed into the jawbone. The use of the implant posts allows All on 4 to offer exceptional benefits that are not possible with traditional tooth replacement options. With the posts placed into the jawbone, the body naturally accepts them by stimulating new bone growth. This not only helps to preserve your bone density, but also creates a secure and stable foundation for the denture. You will never have to worry about any slipping or irritation. In fact, when compared to traditional dentures, you will enjoy an increased biting force of over 70%! Dental implants offer over a 95% success rate and they have the potential to remain in place forever. Their long-term success relies on your candidacy for the procedure. Unfortunately, it is not the right option for everyone. Your dentist in Los Angeles will perform a comprehensive consultation to ensure that they are the right choice for you. Generally, if you have good oral health and adequate bone density, you can get All on 4; however, your dentist will also need to discuss your medical and lifestyle history. This is necessary to ensure that there are no risk factors that increase your risk for infections or difficulty healing. If you are a candidate, a customized treatment plan will be created. In some cases, you may need additional procedures prior to having the dental implants placed, like tooth extractions or bone grafting. You do not have to live with the challenges of tooth loss. You can get the next best thing to your real teeth with All on 4. If you are ready to make an investment in your quality of life, it is time to take the first step. Contact your dentist to schedule your consultation. Dr. Adam Geach is a highly-trained prosthodontist who provides advanced care for his patients. In addition to general services, he can treat complex issues, like tooth loss. He offers the latest solutions to help you regain a complete smile, including All on 4. He will help you restore your smile with dental implants. Contact Geach Dental today to schedule your consultation.